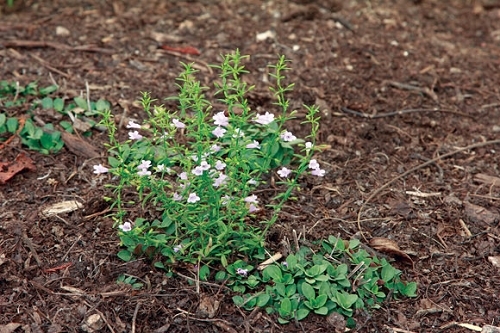 Calamint would be a great choice for rock gardens, rock walls, and green roofs; it thrives in hot, dry sites. As soon as scratch-and-sniff technology for the computer gets here, you'll be amazed; calamint's crushed leaves are very aromatic. A pennyroyal-flavored tea can be made from them. Seed: The tiny seeds need light in order to germinate, so just sow them on the surface. Cold stratification is usually not needed. Part of my edible natives garden. Wonderfully scented, lovely tea. Pretty little pinkish flowers.